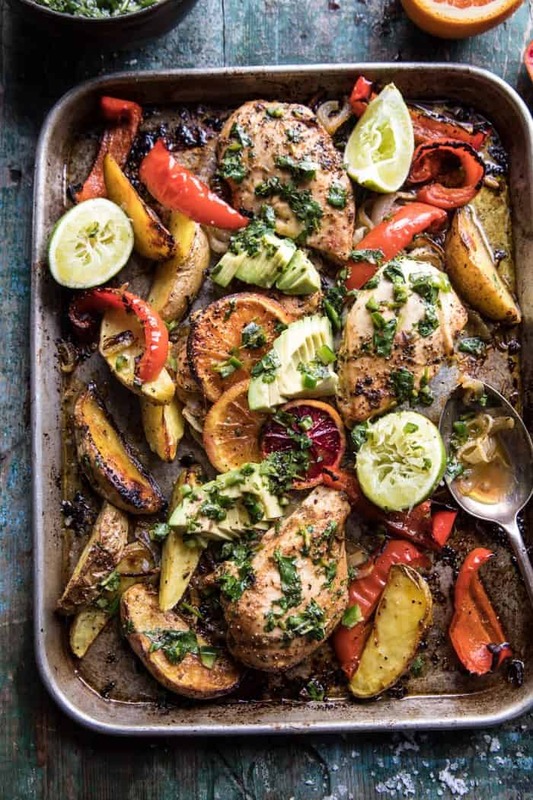 Taking sheet pan dinners to a whole new level with this Sheet Pan Cuban Chicken With Citrus Avocado Salsa. I didn’t mean for this to happen, but apparently this week’s recipes are all about winter citrus. From Monday’s salmon, to yesterday’s smoothie, and on to today’s cuban chicken. Citrus obsessed? Maybe just a little, but I’m fully embracing all the produce winter has to offer and loving it! You know what I’m also loving? Sheet pan dinners, which you will soon realize, as I have a few more sheet pan recipes coming your way this month. Like most everyone else in the world, I’m all about a dinner that can be made entirely on one pan. Using just one pan means less to clean, minimal hands on time, and typically a pretty quick cooking meal. Uh? Big fat yes to that! All of the above means more time to spend cozied up by the fire on these super cold January nights. And when I say super cold, I mean super freaking cold. I’m talking a brisk five degrees…although I shouldn’t be complaining, because this is the mellowest winter ever here in Colorado. I think you guys on the east coast might be having colder temps, in which case, you should definitely be cozied up by the fire while this Cuban Chicken cooks in the oven. Anyway, when I was brainstorming recipes for the month, I knew that I really wanted to incorporate all the beautiful winter citrus. For whatever reason, whenever it comes oranges, grapefruits, and other winter citrus, my first thought is to just simply eat them, as opposed to using them in recipes. Growing up, my dad didn’t cook with much citrus (not even lemons or limes), but we ate plenty of oranges and grapefruits as snacks. It wasn’t until I started cooking that I learned how delicious citrus can be in savory recipes. I feel like I don’t use citrus enough. 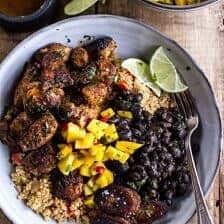 It’s truly one of the best additions to so many recipes, and when I actually put a little thought into it, I find there’s a million and one ways to use these vibrant fruits in savory ways. 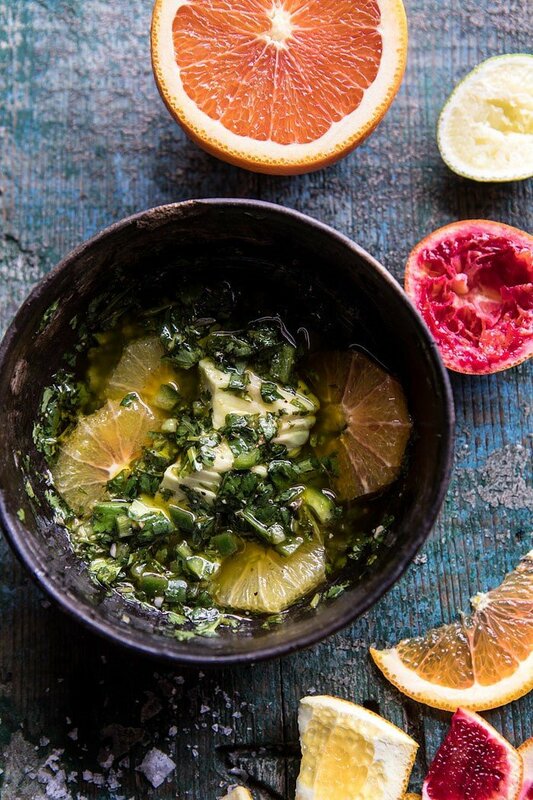 Cuban cuisine is known for being extra citrusy, so it’s the perfect kind of food to be making during these winter months when the grocery store is filled to the brim with blood oranges, cara cara oranges, grapefruits, and those cute little clementines. Like most sheet pan recipes, this one is pretty simple. Season your chicken, add your veggies…roast, roast, roast…and while that’s happening make the salsa. Serve it all up and done! It’s literally a two-step process and in turn you have the most perfect citrusy chicken dinner complete with roasted potatoes, veggies, and even salsa. I mean, I’m not sure it gets better. The chicken is pretty classically seasoned with a good amount of fresh orange and lime juice, plenty of garlic, oregano, and cumin. If you have extra time, I highly recommend marinating the chicken for a couple of hours before roasting to really intensify the flavor and to make for an extra tender and moist chicken. To go along with the chicken, potatoes, and peppers, I made a quick salsa with the cutest little blood oranges that friends brought me all the way from their California backyard! They’re under ripe right now, so they don’t have their bright red hue just yet, but I kind of love their extra tart flavor, and they make for a perfect salsa to spoon over top this chicken. The salsa adds a pop of fresh greens and zingy citrus flavor. It’s my favorite part, but then I say that about every fruit salsa recipe (I’m obsessed). And lastly, if all my rambling on about how good this recipe is has yet to convince you to make it, just look at all the pretty colors happening here. The colors alone tell you this is a must make recipe. Pretty food = GOOD food. OKAY. Fine. That might not always be true, but in today’s case, it’s true, you need to make this chicken! 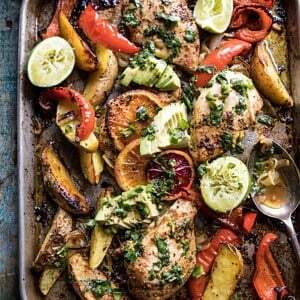 Like most sheet pan recipes, this one is pretty simple. Season your chicken, add your veggies, roast, roast, roast, and while that's happening make the salsa. Serve it all up and done! 2. 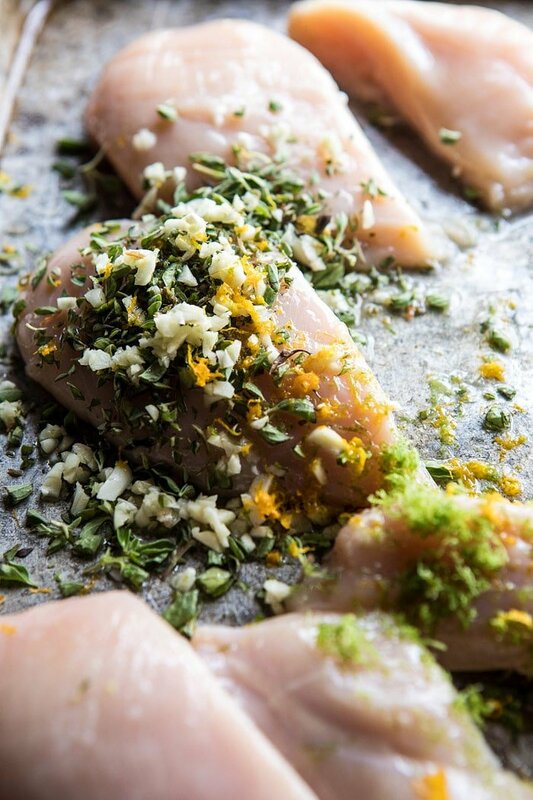 On a rimmed baking sheet, combine the chicken, 2 tablespoons olive oil, the garlic, oregano, cumin, cayenne, orange juice + zest, lime juice + zest, and a large pinch each of salt and pepper. Toss well to evenly coat the chicken. Add the onions, potatoes, and bell peppers, and toss with the remaining 2 tablespoons olive oil and a pinch each of salt and pepper. Arrange everything in an even layer. Add the orange slices and then transfer to the oven. Roast for 40-45 minutes, tossing halfway through cooking until the chicken is cooked through and the potatoes golden. 4. To serve, top the chicken with the salsa. Eat! I’ll be cooking a take on this one tonight, for sure!! Minus the avocado, as I cannot stand avocado. Yay! 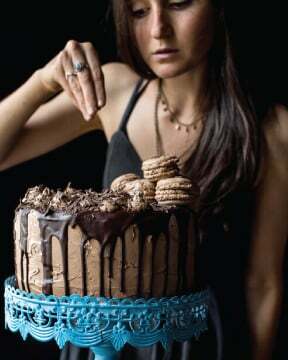 Another HBH recipe that I can make with all my food allergies! Thanks! And yum Yum Yum! YAY! I love your sheet pan recipes. 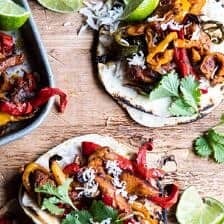 My fiance and I are OBSESSED with your sheet pan fajitas. 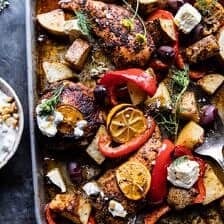 I made the greek sheet pan chicken on monday and it was so good! 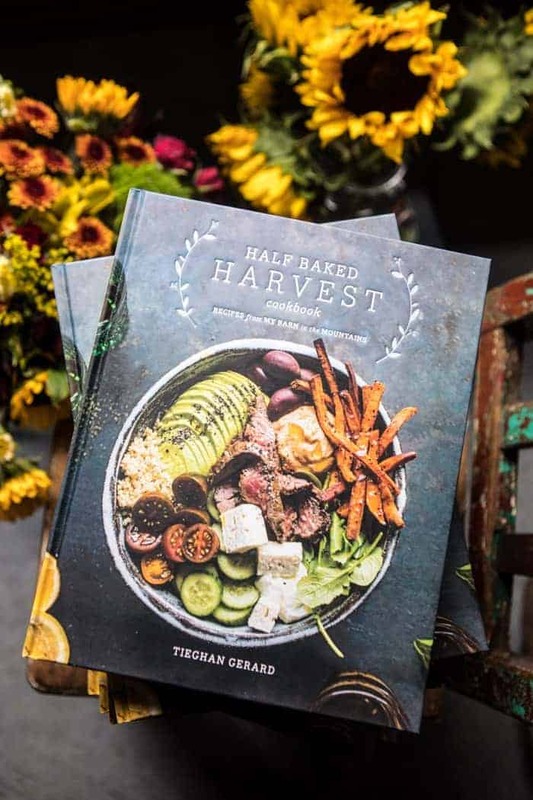 I’m looking forward to trying this one and future sheet pan recipes! Thanks! Sounds great and look forward to trying this out! For the “2 tablespoons orange zest + orange juice”, do you mean that I should use all the zest from one orange then use 2 tbsp of its juice? Or are you saying 2 tbsp of zest + 2 tbsp of oj? Thanks! Thank you for the feedback, but I have done a lot research on cuban flavors and the ingredients used within this recipe are cuban. Thank you again for the feedback. Sounds like such a flavorful dish Tieghan! 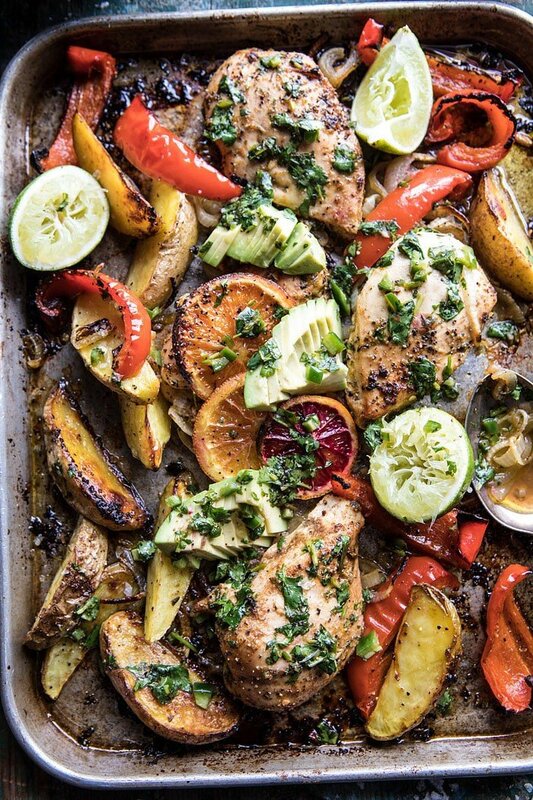 Nothing beats a sheet pan dinner for those busy nights! 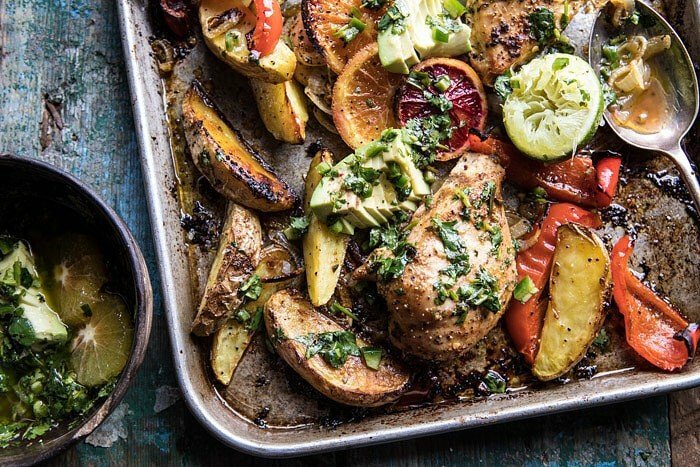 So happy to see another sheet pan recipe! I made your Greek chicken one last week and my husband was all about it. And you truly cannot beat being able to walk away and chill while dinner is in the oven! Excited for more too! cubans don’t eat salsa. cubans don’t eat avocados like this. this is offensive. as are all of your white washed latino dishes. Well, this Cuban eats avocados and salsa! If her recipes are so “white washed” maybe you should spend your time browsing elsewhere. No one’s forcing you to make her recipes. This looks totally phenomenal! What a fun and easy sheet pan recipe. Delicious but not as pretty. I think I needed to roast a bit more to get the caramalization you achieved here. Falvors explosive, though! I am so glad you liked this Mark! Thank you! This was easy to make, different, and well liked by my family. Who cold ask for anything more? Thanks for a good recipe! I am so glad you all enjoyed this! Thank you! 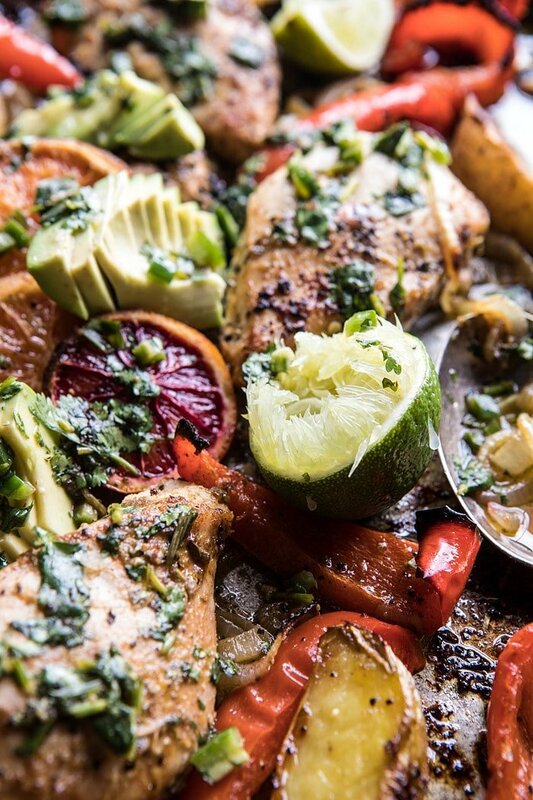 Such a gorgeous dinner idea, love the citrus salsa! This dish looks delish! My grandmother was cuban so I can really appreciate this yummy flavor profile. And who doesn’t love one pan cooking? Right? It is so easy! I hope you love this Carla! Thank you! This was a really good recipe! First, I would eat almost anything topped with that salsa. As for the bake, I marinaded the chicken in advance and it was delicious! Next time I might reduce the potatoes to only one. I found the quantity to be unnecessary. You saying this is to the next level, is an understatement LOL! This has got to be one of my favorite new dishes. Serious flavor explosion. I can’t believe what a wow factor the citrus gives. 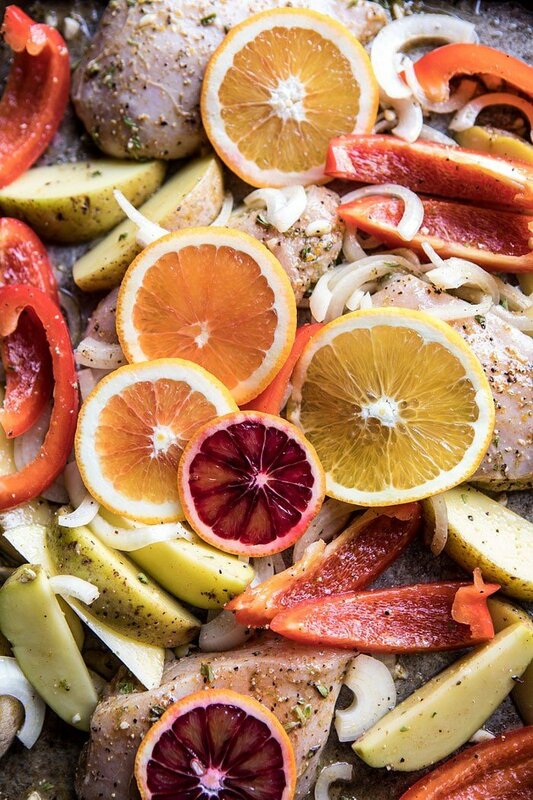 The citrus slices are amazing roasted. 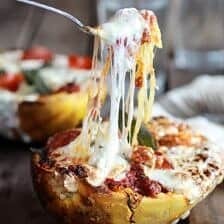 Super easy to make, Super flavor & huge WOW factor. Me & the kids loved this dish! Thank you!! I am so glad you and your kids loved this recipe Karen! Loved this dish! Easy to prepare and so very flavorful! I have a package of quartered, bone-in chicken pieces defrosting. Will this recipe work with that? I’d imagine it would affect the time it’s in the oven…Looks delicious! I made this for dinner a few nights ago and my family loved it so much we had it again last night! 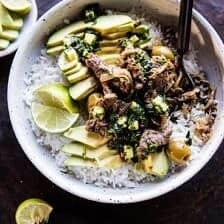 I served it with some coconut rice and it was perfect! We had to use sweet potato last night because we were out of regular and it still was really good! People were licking the plates, and by people I mean me. SO delcious! Haha that is amazing! So happy you liked this Paris, thank you! This was fragrant, flavorful, beautiful to look at, and very easy to make. Thanks for another great recipe! The recipe is good but you really should not call it Cuban. Have you actually been to Cuba? Cuban food is not spicy at all. If you like spicy/hot food, you would have to ask for a hot sauce to add to you plate at a Cuban restaurant. In Havana, they now carry hot sauce for tourists but outside Havana it is impossible to get any hot sauce at the restaurant. When tourists express their surprise to Cubans as to how non-spicy their food is, Cuban proudly state that their food is more like Spanish food and not at all like Mexican. They take offense when their food is being compared to Mexican. Hey Kara, thank you so much for the feedback. I have not been to Cuba, but I like spicy food, which is why I included it in the recipe. Very happy you enjoyed this! Thanks again! Just made this tonight – delicious!! I used a large turkey roasting pan and it wasn’t big enough to have a single layer, so some of the veggies didn’t get crispy. I’ll have to try with a larger flat pan because the crispy ones were better. I followed the recipe exactly except for substituting red pepper flakes for Cayenne, it was great!! You MUST MAKE THE SALSA!! SO GOOD!! Thanks for this recipe, I’ll definitely be making again! Also, i used navel oranges so it wasn’t as pretty as yours- I should’ve read the full post and would’ve tried with other ones but it was still great with the navels! Ah thank you so much Amy! I am so glad you enjoyed this recipe and hope you love others on my blog as well! This recipe for the Cuban Chicken popped up in one of my games.I read the recipe and showed it to my son and daughter in law.We decided to make it today.It was absolutely incredible.All the different flavors blended in perfectly.Cant wait to try another !! 5 Stars!!!! Followed the recipe EXACTLY, without any changes and it was absolutely delicious ! This is certainly a “keeper” and we will make it again in the near future. Thank you for sharing the recipe. I am always on the lookout for 1 pan or sheet pan dinners as I love short prep times and less dishes to clean on weeknights. That being said…….YUMMY!!! Absolutely loved it. I was a little befuddled at the thought of the salsa on it…..but SO happy I made it as it really finished it off wonderfully!!!! I have already shared the recipe with friends and I will come back to your site again now that I know you are here. 5 star for sure in my book! Prep time takes a bit but oh so worth it! Thank you so much Nancy! I am so happy that you enjoyed this dinner and hope your friends do as well! This was delicious ! Loved. Thank you. Now, I made several modifications but it was still tasty. I use veggies I had on hand: Brussels sprouts, asparagus, red potatoes. For the marinade I used dried oregano because my plant died or is hibernating. Lol. And I didn’t have all the ingredients for the salsa so I served with sliced avocado. And a side of just cooked pink beans. I have extra marinade so I plan on making this again soon. Everyone should try this. It’s easy and tasty. Thank you again! Sounds amazing! I am so glad you loved this Teresa! Thank you! I am horrible with a knife (prep took me a LONG time and a finger injury ), but the taste was absolutely worth it ! Only thing I left out was the jalapeno (open wound ! ), but can’t imagine how it could have been better. And though not as gorgeous as the recipe picture, still was colorful and amazing looking. Thank you so much for this recipe! I am so glad you liked this recipe Kristin! I hope your finger is okay and not too badly injured! Thank you! Despite loving most foods, over the years I have developed a pit/stone fruit allergy. This means that even though we would love to try your Citrus Avocado Salsa, we can’t without my face swelling up. What other types of salsa would you suggest? Finally decided to leave a comment, as I’ve already lost count of the number of times we’ve made this! I’ve done it with wild caught salmon for a dinner party, too (the only dinner party I’ve ever actually thrown…but this recipe was worthy of it!). We sub clementines for the zest and orange, as we always have them on hand. I’ve used dried oregano but fresh is far superior; we’re planting it in the sqaure foot garden this year with this recipe in mind. Good with or without the avocado salsa! Thank you so much Kirsten! I am so glad you love this recipe and it turned out amazing for you dinner party! This is one of those dishes you can’t seem to stop eating! Very simple, bright and fragrant dish that I will be making again very soon! Thank you so much Jacob! I am so glad you like this! I love all you did with the oranges here! It’s really something what a bit of orange can do. It’s refreshing and adds balance to uber tart citrus like lemon and lime. My dad’s girlfriend has a blood orange tree. I cut them into wedges, minus the membranes, for an incredible salad. Last week I made a lemon icebox pie, like condensed milk-based key lime pie, using lemon juice instead of lime. I had fresh oranges whose color was so gorgeous, I simply had to squeeze it! The orange juice truly took the pie to the next level. It helped balanced the richness of the milk and ultra-tartness of the lemon. Wow! Wow that sounds so amazing! I am so glad you like this recipe! Thank you Monique! I made this one night for dinner and my husband said it was one of the best meals I’ve ever made, and my husband really likes everything. I love it not only because it’s delicious but so easy to make – I love the one sheet-pan! We could eat this easily every week for dinner. For two people it also makes enough for leftovers. Thanks so much for the amazing recipe!! I am so happy to hear that! Thank you so much Cara! This was declared a winner by my family. Thank you for posting a simple and healthy recipe that is loaded with flavor. What size baking sheet are you using, half, full? I guess it goes with out saying, but to be sure, “1 orange, diced” is actually “1 orange, peeled and diced”. Correct? Hi Richard! Yes, that is correct! I hope you love this! I made this last night. I marinated it over night and baked it when got home. I am not a cook but I need to try some new recipes. This is the first one I tried from your website. I was concerned about using all the fruit because my husband isn’t into sweet foods but the flavors all cooked together. It was delicious! I am telling all my friends about it! 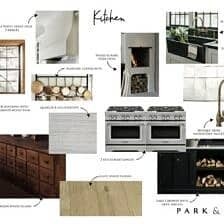 I can’t wait to try another Sheet Pan recipe! I am so glad you loved this Brenda! Thank you so much! Loved this recipe!! It’s easy to prepare and packed full of flavor. Highly recommend!! Absolutely lovedddd this! So refreshing, full of flavor, easy!!!! Super healthy! YES! I am so glad you loved this recipe Viviana! Thank you! This was delicious, easy, and really affordable for me to make! 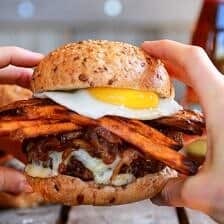 My boyfriend is happy, my stomach is full, and I’ll absolutely be making this again. Thank you! Thank you so much Katie! I am so glad you and your boyfriend loved this! I made this tonight and ultimately it was delicious! However when I checked on the potoates half way, the chicken was totally done. I had to remove it from the oven and put the potatoes on a separate baking sheet back in the oven bc they were just drowning in juice and not roasting. After those adjustments and 40 min for the potatoes, everything was delicious! I am so happy to hear that! Thank you so much Elise! Hi Tieghan, yeah, made this for supper tonight. It was delish.I definitely will be adding this to the rotation. My husband and I both loved it. Thank you. Love the sheet pan recipes!!! Keep up the great work and don’t doubt yourself. You are so gifted and talented. I am thankful to have found you. I am so thankful that you found my site as well! And I am so glad you and your husband loved this recipe! Thank you Becky! Would this work for bone in chicken thighs and drumsticks? Maybe shorten the cooking time? Oh. My. God. This was the most delicious meal! Everyone in my family loved it and there were no leftovers, which made me a bit sad. The flavors are so vibrant and delicious. We will make this again and again. Thank you! Thank you so much Kelly! I am so glad you and your family loved this recipe!! 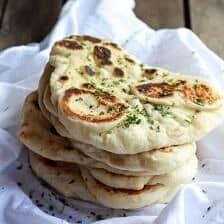 Are there any additional side dishes you’d recommend to round out a complete dinner with this recipe as the main dish? A bread? And, how about a dessert recommendation? Made this for a family dinner and everyone loved it, I used chix thighsband they were so tender and juicy. The salsa was so yummy I should have doubled it. Definitely,making this again. I made this this week and it tasted great, but almost ruined my sheet pan and silicone mat. Is there a good way to protect the pan? And what do you use to clean your pans? I love your site, and cookbook. Keep up the good work! I have seen this recipe a few times in my Facebook feed and finally decided to make it for dinner tonight. Oh my I am glad I did! The flavours were incredible and the salsa paired very well with the chicken. Thank you Tiegan for a quick and delicious recipe! This is so yummy!! The salsa is amazing and I love the flavor combo. Super easy too..make it! !